Description: The Crashing Waves Bar gets its name from the curved elements that look like ocean ripples on the front of the bar. The loops on the back are arranged diagonally and alternate colors. As you make the design, you will be looking at the back. 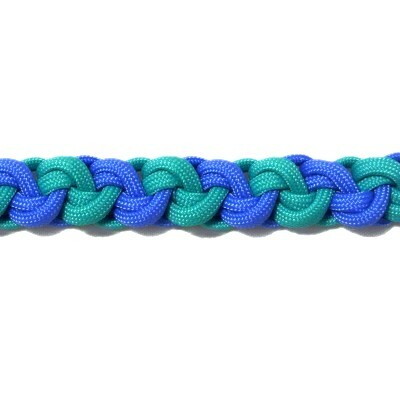 You could use this decorative knot sennit for a Macrame belt, bracelet, or any project where you need a slender chain of knots. 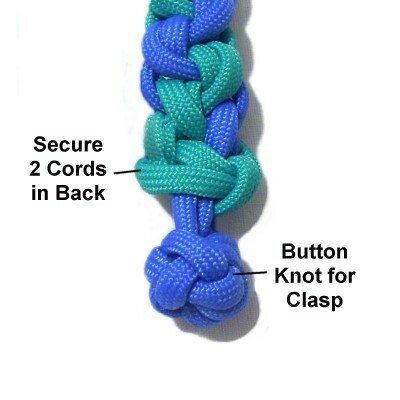 The instructions include a loop at one end that can be used as a clasp. 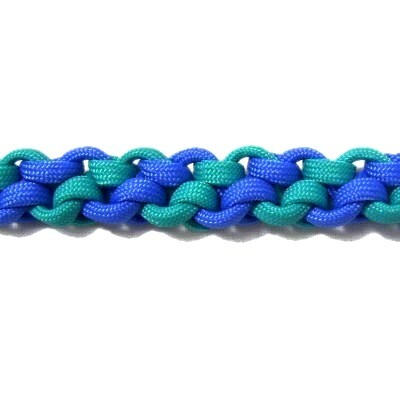 The material used in the example is 550 Paracord. Please read the bottom section of Cord Preparation if you intend to use this material and do not know how to prepare it for knotting. 2018 Update: I made some changes to the text as well as the photos, so please contact me if you need the original page. 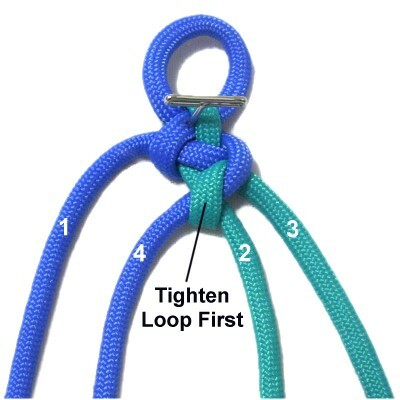 I found this technique on the Fusion Knots website. 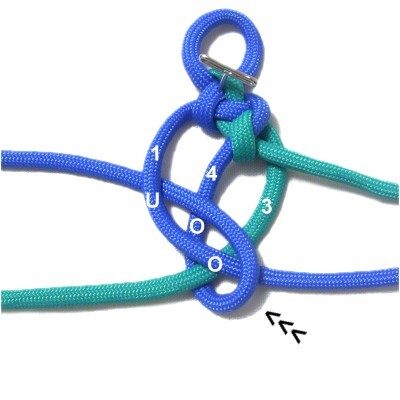 The video gallery contains tutorials for a wide variety of combination knots and techniques. To practice the Crashing Waves Bar, you need two cords of different colors at least 60 inches long. The cords should be at least 7.5 x the finished length you plan to make if you are using this design in a project. Step 1: Make a loop in the center of cord B, crossing right over left. 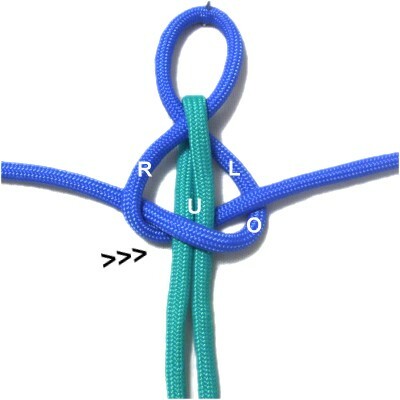 Fold cord A in half and arrange it around the crossing point of the loop vertically. The left half should rest under the crossed area and the right half over it. 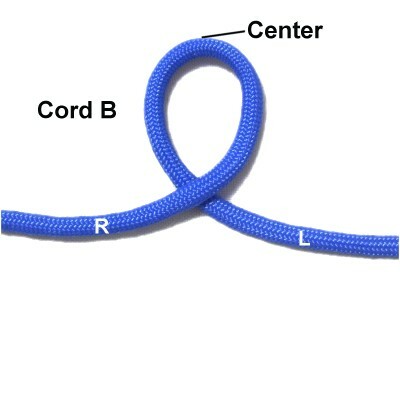 Move the left half of cord B to the left, passing over both halves of cord A. Bring it under the right half of cord B. 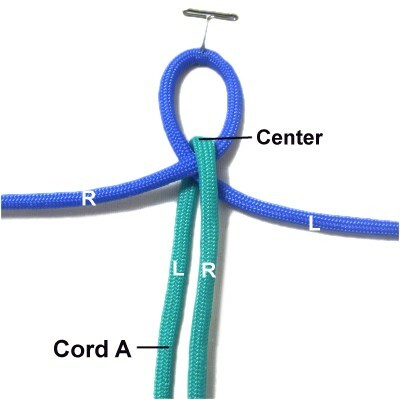 Move the right half of cord B to the right, passing under both halves of cord A. Pull it out on the right, passing it over the left half of cord B where it curves. Tighten the knot and adjust the size of the loop so it's suitable for your project. 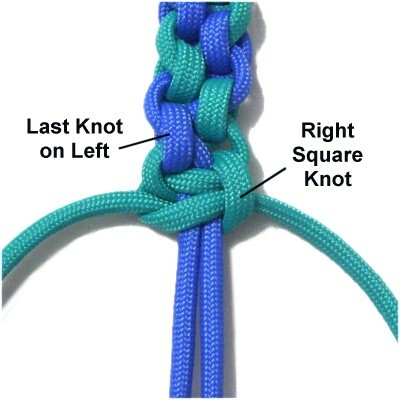 Each knot is made with three cords, which switch positions to form an alternating color pattern. Mentally number the four segments where they rest now, and view them as four separate cords. Step 2: Move cord 1 aside. Arrange cord 3 so it's vertical. Cross cord 4 over cord 2, resting on top of cord 3. Move cord 3 backward, folding it over the crossing point of cords 2 and 4. Rotate it clockwise to the right, passing it over cord 3 and under cord 4. Tighten the loop first, by pulling on cord 3. Then tighten cords 2 and 4 until the knot is firm. Designer's Tip: It's important to understand the concept for the Crashing Waves Bar, since the cords switch positions. Try to find these features in the next images. 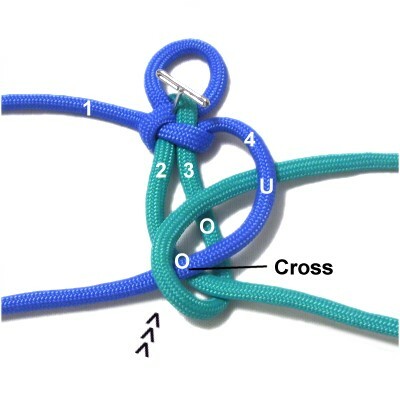 Locate the cord used to make the loop in the previous knot. Pass it under the cord next to it. That cord is then moved aside. 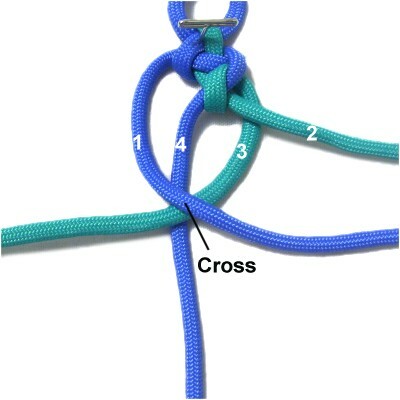 The remaining three cords are used to make the new knot. One is the cord used to make the previous loop. Another is the cord you moved aside in the previous step. The third is resting between them. 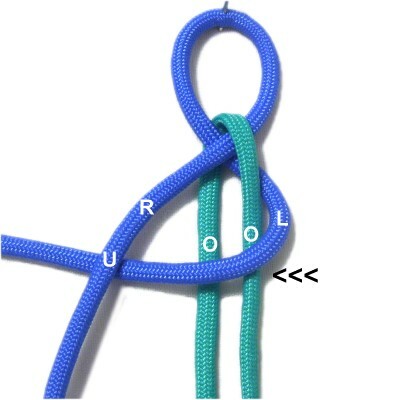 The cord in the middle of the group is used to make the loop for the new knot. The other two are crossed. Cross the two cords left over right for all the knots on the left (step 3). Cross the two cords right over left for all the knots on the right (step 2). When you make the loop, the cord passes over the crossing point and under the cord on the outside. On the right, the loop is made clockwise heading right. On the left, the loop is made counter-clockwise heading left. Step 3: Locate cord 3, which was used to make the loop in the previous step. Move it under cord 2, which is next to it. Arrange cord 4 so it's vertical. It's in the middle of the group, so will be used to make the loop for the new knot. Cross cord 1 over cord 3 (left over right), resting on top of cord 4. Move cord 4 backward, folding it over the crossing point of cords 1 and 3. Rotate it counter-clockwise toward the left, passing it over cord 4 and under cord 1. 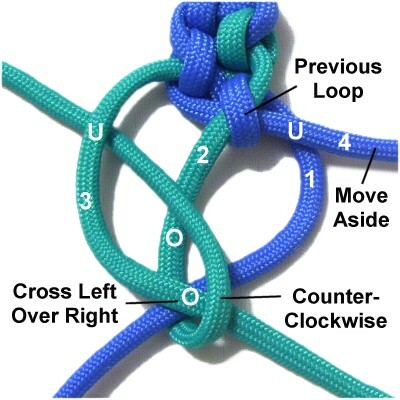 Tighten the loop first, then the rest of the knot. Step 4: Locate cord 4, which was used to make the previous loop. Pass it under cord 3, then move cord 3 aside. Cross cord 2 over cord 4 (right over left), resting on cord 1. Make the new loop with cord 1, rotating clockwise. Tighten the loop, then the crossed cords. Step 5: Locate cord 1 and move it under cord 4. Move cord 4 aside. Cross cord 3 over cord 1 (left over right) resting on cord 2. 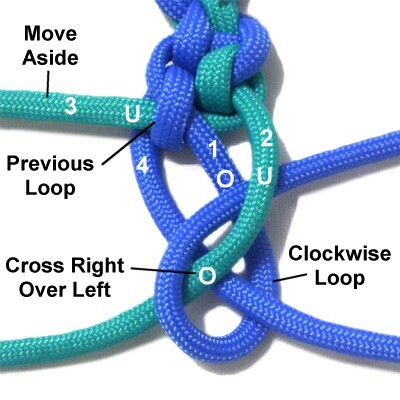 Make a new loop with cord 2, rotating counter-clockwise. Step 6: Repeat steps 4 and 5 several times. The cords will switch position each time you tie a new knot. Stop when the Crashing Waves Bar is the size you need for you project. 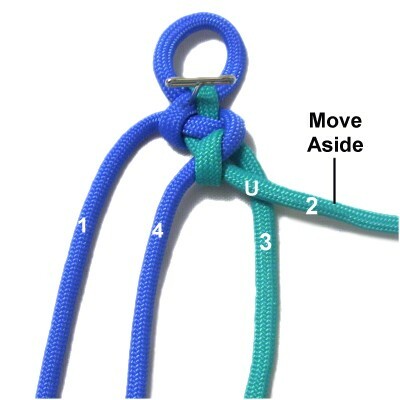 Step 7: Tie a Square knot with the two cords furthest to the right and left. 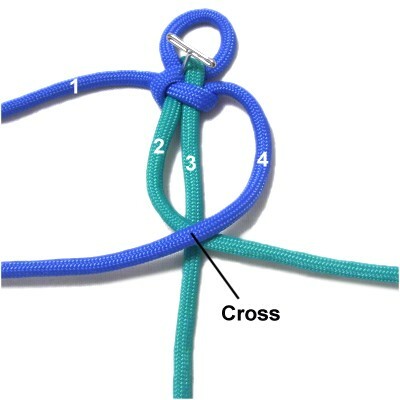 Tie a RIGHT SK if the loop for the last knot you tied in step 6 is on the left. Tie a LEFT SK if the last loop is on the right. Step 8: Finish off the 2 cords used in step 7 by securing them to the BACK of the Crashing Waves bar, which is the side you've been looking at. The remaining two cords can be used to tie a button knot if you need one for a clasp. Have any comments about the Crashing Waves Bar? Contact Me.